I paid $375 for this Martin DM Acoustic. Retails new for $899! …you can easily save anywhere from $50 to $500 and sometimes even more. Apart from allowing the possibility of acquiring a vintage or otherwise discontinued model, the main benefit of buying a used guitar is the savings opportunity. Depending on the model and the condition the guitar is in you can easily save anywhere from $50 to $500 and sometimes even more. In that sense, if you are on a tight budget, you can get a lot more instrument for your money. Apart from the immediate savings at the time of purchase, there are other indirect benefits pertaining to price that you must keep in mind when looking for used guitars for sale. First of all, many quality guitars only depreciate to a certain point. This means that not only would you save money at the time of purchase, but since the depreciation hit you are going to take is much less, when it comes time to sell it you will be much better off than if you had originally bought a new one. Furthermore, if you manage to acquire a second hand limited or special edition guitar you may find that after a certain amount of time the instrument will actually go up in value! When it comes times to sell it you can break even (even after having used the guitar for a few years) but in some cases you can even make some profit on it! Again, you have to know the market and study guitars and brands well to really get a grasp on how this works. The concept is also similar for used bass guitars and acoustics. I love to buy used special edition USA-made guitars. Even if the guitar never appreciates in value, the possibilities of losing a bunch of money on it when selling are very small. I’ve had a couple of used Gibsons that have appreciated in value during the time I owned them. If I want to sell fast, I can easily break even. If I’m patient, I can make a profit on them. Ironically, I once bought a brand new special edition Gibson Explorer that actually managed to go up in value after I had owned it for one year. I ended up selling it for $50 more than I had paid when new! Same thing happened to me with a limited edition mahogany dual humbucker Telecaster. 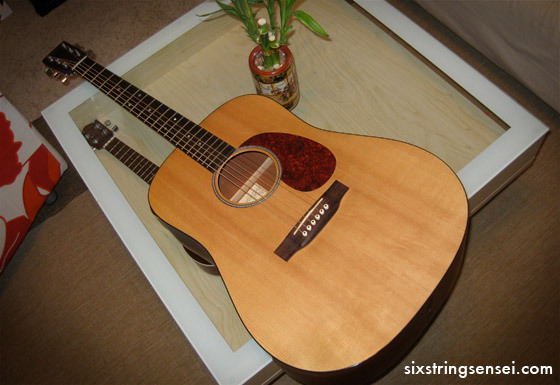 $50 is not a large sum of money, but very surprising for a new guitar as they usually depreciate a lot. Having said that, imagine the possibilities if you buy a second hand guitar at the right time in the guitar’s life. Cons – What to watch out for. Like with anything else, there are downsides to buying a used guitar. First, if you are looking to buy a guitar with a warranty, you need to find out if the manufacturer of the guitar in question allows for the remaining warranty period to be transferred to you along with the change of ownership. In most cases, a used instrument would have been proven by then, so warranty concerns are not that big of a deal but it’s always better if you can have the option of keeping the warranty coverage. Proper maintenance and future care are far more important at that point though. Another VERY important factor to consider is the risk of buying a counterfeit instrument. Not such a problem with the less popular guitars, but nonetheless a BIG problem for popular models. Gibson Les Paul models, for example, are copied all the time. A trained eye can usually spot them right away, but some are harder to identify especially by a less experienced buyers. Un the upside, if you are looking to buy a Les Paul, there are great deals out there. You can buy a Les Paul Standard for $1,700 or so (new about $2,400). But, be wary of too good to be true prices. There are many counterfeits of Les Pauls out there so be very careful you don’t get ripped off. If you find one that you like, try and have an expert look it over. If the seller refuses, just walk away. It’s a little over a grand and a half, not simply 500 bucks. That’s a lot of money to be swindled out of. Finally, keep a watchful eye for abused instruments or concealed damage. Abused instruments are easy to spot. They usually have all kinds of dings, dents and scratches all over the place and the fretboard is usually dirty. However, at least it’s stuff you can see. If the neck is straight, the frets good and the overall structure solid, then a big savings can be had on a very useful guitar. However, concealed damages are a worse problem because the guitar may look great but the reality might be completely different. Watch out for a guitar that has been repainted. This could mean that it may have been repaired and repainted to cover up the work done. Be especially wary of Gibson neck joints, there are tons of Les Pauls that after being dropped snap at that spot. A repair can be done well, but concealing it with paint and trying to sell the guitar as “perfect” is just plain wrong. Having said that, you can get a great deal on a Les Paul with a repaired neck joint but you must be sure the repair was done well and the final price must reflect the previous damage. To conclude (so I can go play). The bottom line is that at some point of your life you are simply going to desire a brand new instrument. There is a sense of satisfaction that comes from buying your first brand new guitar. This stage is usually when you have guitar-fever and you are completely in love with playing or learning to play guitar. But, when you are in the stage in your life when you realize that you can get a fabulous instrument for a lot less cash by buying second hand, you get a whole other sense of satisfaction. This sense of satisfaction comes along due to less buyer’s remorse and more money left in your bank account. This satisfaction then increases further once you start developing a new relationship with your NEW used guitar. After a few months if will feel completely yours. It will eventually feel like it was never even owned by anyone else. That’s the way I feel about my Fender American Ash Stratocaster HSS Sienna Sunburst, which by the way, I paid $700 for. It’s now worth right around a grand!